Teknotherm Refrigeration provides custom-designed, custom-built refrigerated seawater systems for the commercial fishing industry. Our many years of experience mean that you get a system that is efficient, reliable, and specifically suited to your application. Freon or ammonia systems are available with electric or hydraulic drives. 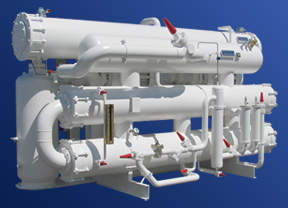 Since our inception, Teknotherm has specialized in delivering top-quality, custom-built refrigerated seawater systems. Our experience and expertise in designing, building, and installing RSW systems is unparralled in the industry. We will evaluate your refrigeration needs and develop a custom solution that will make sure your product stays at its best. 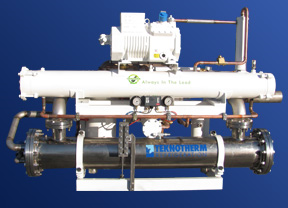 Teknotherm flooded RSW systems are the best in the industry and have proven their longevity for over 20 years. Chillers and condensers feature carbon steel shell, 316L stainless steel double-grooved tube sheets, grade 2 titanium tubes (enhanced titanium tubes available) or copper nickel enhanced tubes and cast iron end covers with replaceable corrosion plugs. Our RSW systems are the best in the business. Each one is crafted by hand in our shop in Seattle, Washington, to exacting specifications. Our staff engineer insures each system is designed for optimal performance. Teknotherm DX (or dry expansion) RSW systems are built with the toughest materials around. The chillers feature 316L stainless steel shell, flanges, tube sheets and end covers. Titanium or copper nickel tubes. We have many options available to upgrade your existing RSW system. Whether you need to convert to a different refrigerant, increase your existing capacity or simply improve the efficiency of your system, Teknotherm has the experience and solutions necessary to help you. We offer an RSW “booster package” specifically for DX systems which will increase your capacity by roughly 25% with minor modifications and additions. Feel free to contact us if you need to upgrade your existing RSW system.